Amidst this crisis, it is worth taking a look back at the road that we have traveled on our way to the current predicament. 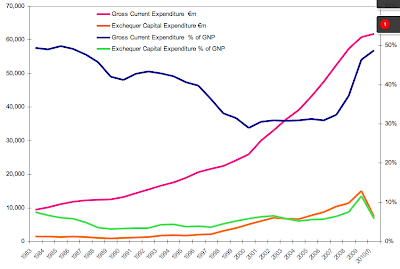 It is fashionable today to make claims that the past - the recent past in fact - has been a place of greater fiscal responsibility, the age of 'sustainable' public finances. But is the claim true? Have lost our way all of a sudden around 2005-2007, or have we always been traveling along the same route. 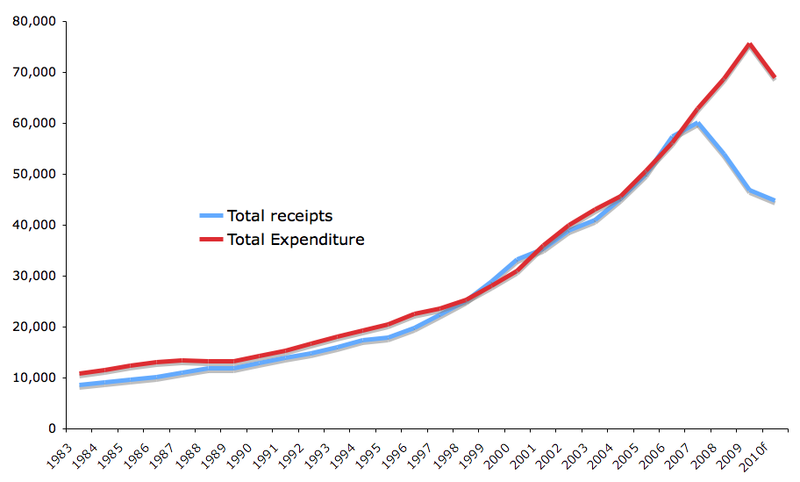 In absolute levels terms, spending and tax receipts have clearly grown dramatically over the years. These are nominal figures, of course. But notice that total expenditure line almost invariably exceeds total receipts levels. The chart also shows pretty dramatic changes that took place since 2007. 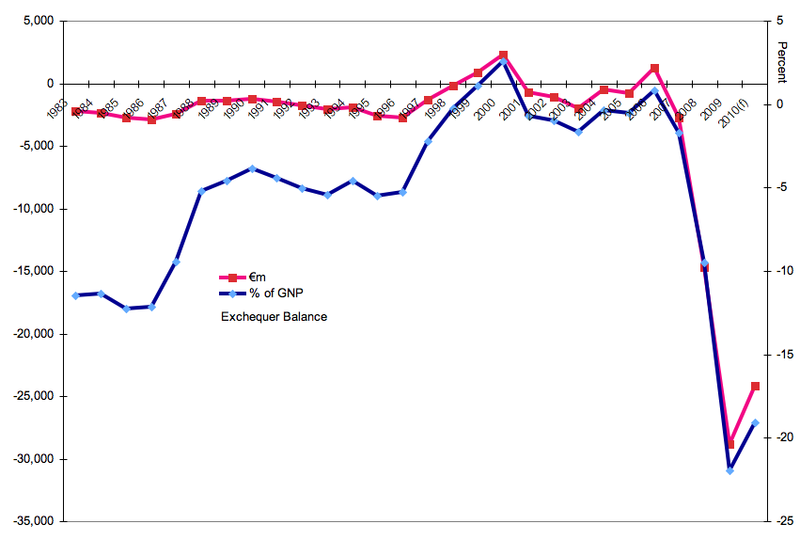 Clearly, gross current spending has been a core of the overall Exchequer financing. The most dramatic departure from 'investment' focus toward current spending focus took place around the turn of the century. Looking at the comparatives across the shares of GNP taken up by capital and current spending shows this even more dramatically. 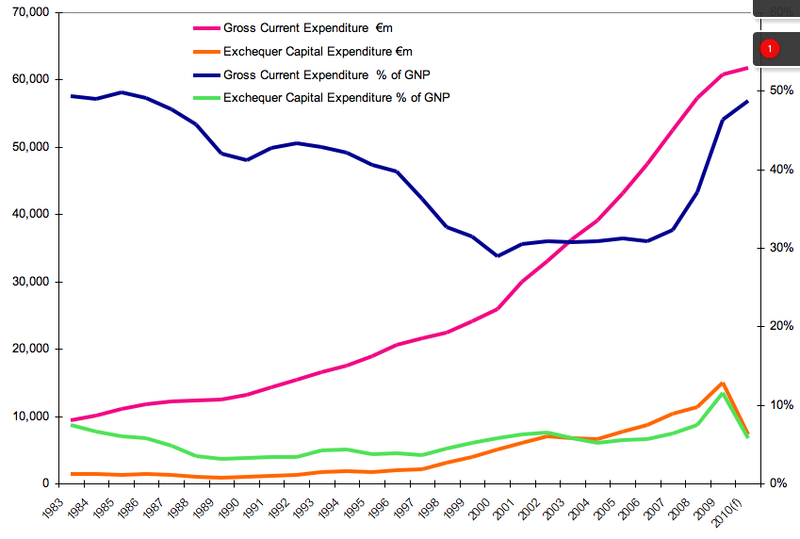 If during 1985-2000 period current expenditure declined as a share of GNP, capital spending first fell (through 1988) then stagnated (through 1997), and then rose through 2002. Capital spending stagnated in the boom years of 2003-2007 and then rose again (due to contraction in GNP) through 2009. However, from 2006 through today, current spending went through the roof. 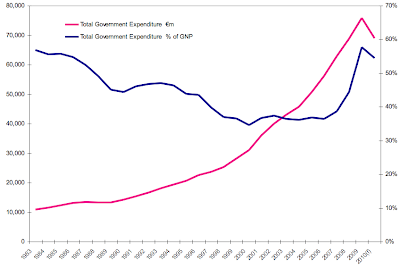 Another interesting feature of the chart above is that during the current crisis there was not a single year when the current expenditure declined - either in terms of absolute level of spending or in terms of spending relative to GNP. 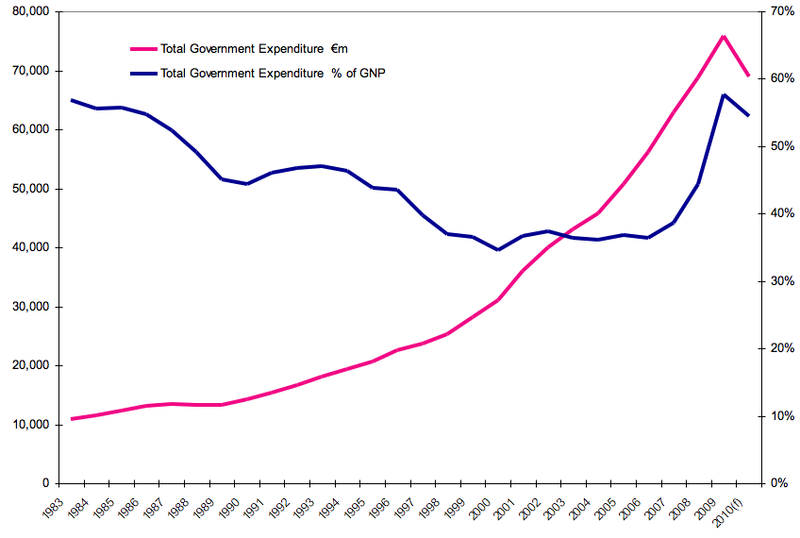 Total government spending both in levels and as a share of GNP is expected to fall this year for the first time since the beginning of the crisis. This, of course, is driven solely by the decline in capital spending, as charts above indicate. Now, let us plot primary Exchequer balances - the difference between the total receipts and expenditure. 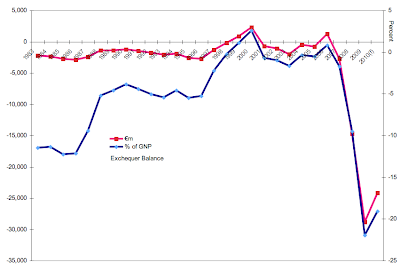 In broad terms, over the long run, Irish Exchequer has been historically on a non-sustainable path. 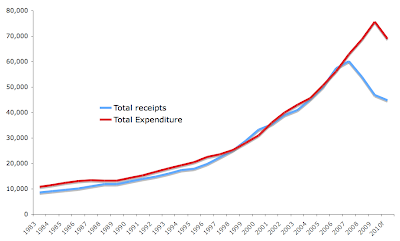 In only 3 years since 1983 did our total receipts cover total expenditure: 1999, 2000 and 2006. In 2009-2010 we have posted worse deficits than in any other year recorded in the abvoe charts. So what about good cop - bad cop game of blame going across the Dail isles? It turns out that on average annual basis, Brian Cowen leads the recent history team of profligate Taoisigh with a whopping (albeit obviously crisis-related) average annual shortfall of €26.5bn so far. 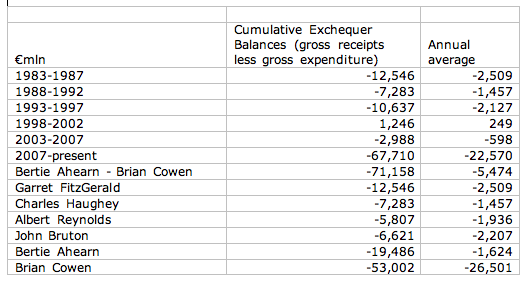 Together - Bertie & Cowen come distant second with €5.5bn in annual shortfalls. But overall, there is not a single Toiseach in the modern history of Ireland who managed to balance the books at the primary level. Hardly a sign of any fiscal 'golden age' in the past. Very much appreciated and enjoyed your contributions at the recent Kilkenomics festival. You are providing an immense service to the taxpayers of Ireland. Up until 2007, from the charts, total expenditures equaled total spending. Do you want to balance a budget during a recession???? Is there a better time? During booms you dont stand a chance, politically, because your opponents will deride you and the public will only shake its head. During crisis (crisii?) you can push hard measures and always draw on the necessity due to the crisis. I think in a perfect world we would always have a balanced Balance sheet and not only in one of the two states. However, we dont live in that world. The best we could do is start thinking about how to make governments more accountable and more fiscally responsible. With the economy growing, then investing might well mean that expenditure should exceed revenue. The real problem was the false market in land and housing, caused by massive capital inflows leading to an appearance of revenue growth, but in fact, it was really capital attempting to be converted into revenue and treated as such by the government. Had they appreciated the dangers of banking without restriction, still less encouragement by government, or had they imposed fiscal restraints with the drop in interest rates, then matters would not be so bad. But they knew nothing except that they could pay themselves more by pretending that this was all natural, instead of borrowed from abroad. Folly! Lunacy! Vote them out, including the opposition, who know so little they could not even oppose! Great analysis, useful graphs. I will use one graph above, taxes vs spending, in my blog article about Ireland's low income tax policy. Graph source will be credited, of course. Thanks. The pension reserve fund was an attempt. Pathetic. Clearly, the payoff on infrastructure projects is greater than on stocks, especially if the investor can raise taxes at any time! They were afraid to tell the truth to others and themselves. Lack of integrity. Integrity means wholeness. So they fell apart! now i know the the road we travel.. little bit confuse on the numbers. Economics 6/11/10: Is Modern Academia Failing?